As the saying goes, if you can't beat 'em, join them. 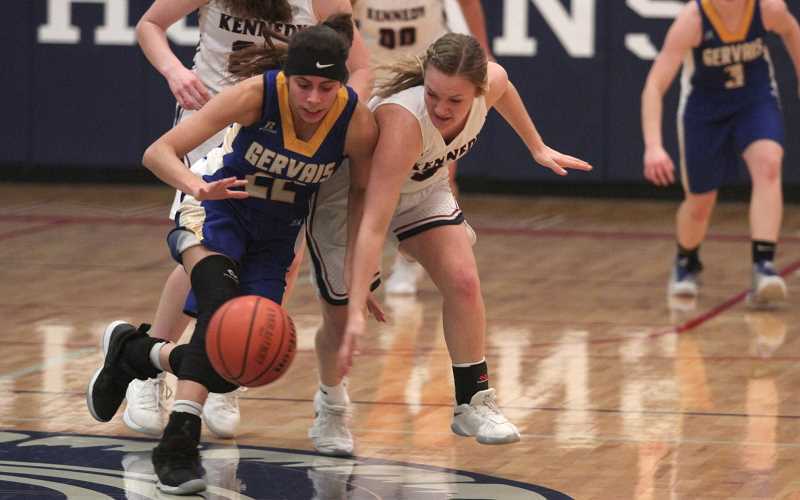 For the visiting Gervais girls basketball team traveling to Mount Angel to take on top-ranked Kennedy, the Cougars tried to take a page out of the Trojans' play book on Friday night — battle for every possession and dive for every loose ball. The two teams stayed within single digits for most of the game before the Trojans (21-1, 11-0 Tri-River) went on a late run to defeat the Cougars (14-6, 7-3) 53-40. "I think our energy came out ahead," Gervais Head Coach Kyle Buse said. "Our focus was there and we handled our game plan very well." 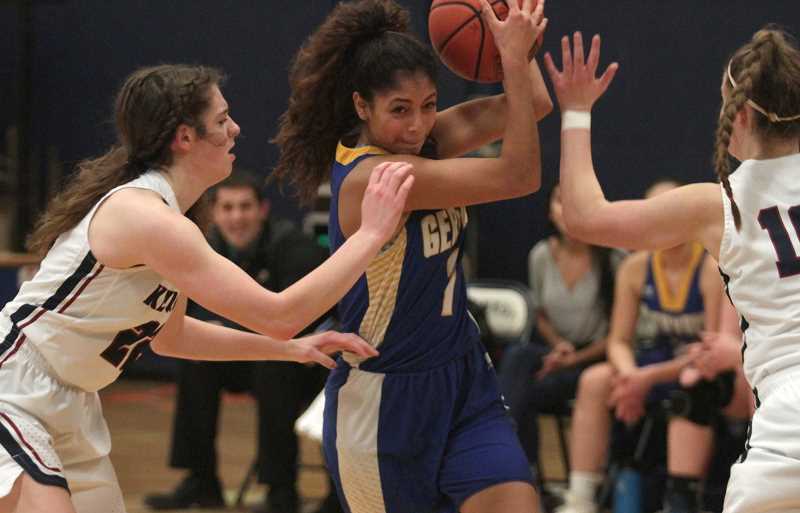 After being sidelined with flu-like symptoms for much of the week, Buse's return to the sidelines on Friday energized a Gervais team that was already eager to see how they matched up against the No. 1 team in the state. The result was a game in which the Trojans were pushed far harder than they have against any league opponent this season. "I love it," Kennedy Co-Head Coach Peter Hall said. "I thought Gervais played great. They were there every time pushing us around. That's what we do to teams." The two teams came out of the gate battling in an unusually strong back-and-forth offensive push. After the Trojans scored the opening point, the Cougars took a 5-1 lead with a 3-pointer from sophomore Araceli Vasquez. The Trojans came back to take a 10-8 lead on a 3-pointer from senior Clarissa Traeger. Gervais responded with four more to go back up, only to have Kennedy sophomore Hailey Arritola hit back-to-back 3s. After the opening quarter was said and done, the Trojans clung to an 18-17 lead. From there, the offensive run cooled off a bit, but the Cougars stayed with it. 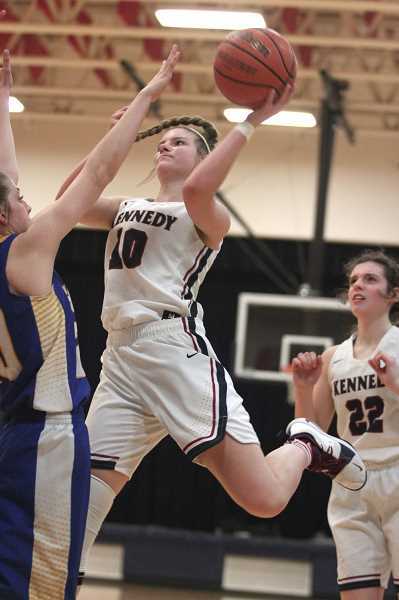 Kennedy scored the opening six points of the second quarter to take a 24-17 lead, but Gervais responded with a 10-4 run to cut the deficit to one on a 3-pointer from Mary Davidson with one minute left in the half. The two teams remained scoreless for the last 60 seconds before Kennedy junior Sophia Carley's put-back rebound at the buzzer gave the Trojans a 30-27 lead. "I think once that first quarter was a high scoring first quarter, we were like 'Ok, we're in it now and let's just keep going,'" Buse said. Coming out of the halftime break, the two teams traded baskets before the Trojans went on another 6-0 run to go up 38-31, but once again the Cougars were there to answer. Vasquez connected on another 3-pointer to bring her team to within 40-36 before Kennedy went 1-of-2 from the line to take a five-point lead heading into the final quarter. Neither team could really get an offensive rhythm going in the fourth quarter. Kennedy held a 43-38 lead with 2:30 remaining before Hall called consecutive time outs to rally his team. He wanted to remind his girls that they are going to be facing hungry teams in the upcoming playoffs, determined to make a statement against the top team in the state, and their reaction could prove the difference between winning a title or not. "I told the girls, 'Listen, just go in there. This two-minute moment is a defining moment,'" Hall said. "Sometimes you just have to execute, you have to lock them down on D and that's how you win a final." Senior Kalyssa Kleinschmit took the words to heart, scoring the Trojans' final 10 points of the game while Kennedy held Gervais to just four points in the quarter to secure the win. Despite the loss, Buse was very pleased with the effort that his team showed and is expecting the team to play with that same intensity for the remainder of the season, no matter the opponent. "We knew it was going to be a physical one, and they know that Kennedy has kind of set the tone as being No. 1 in state and No. 1 in league, that's what we're chasing," Buse said. "I think our energy came out. Our focus was there. We handled our game plan very well."